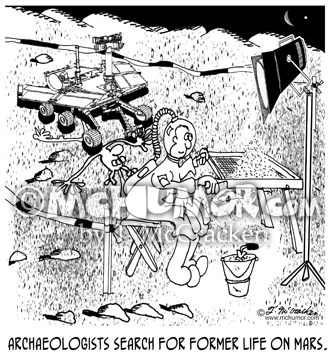 Space Cartoon 7470: "Martian Rovers find proof of intelligent life on the red planet." 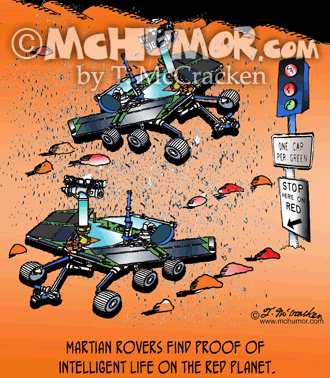 Two space vehicles meet at a stoplight. 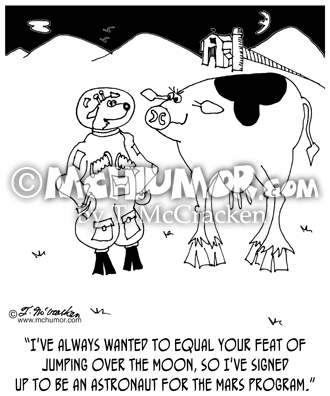 Goat Cartoon 7362: A goat says to a cow, "I've always wanted to equal your feat of jumping over the moon, so I've signed up to be an astronaut for the Mars program." 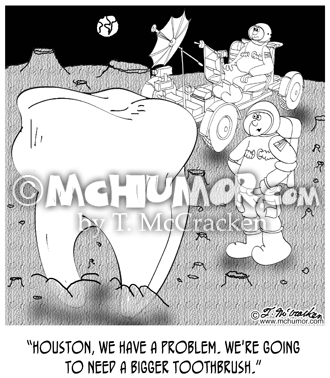 Tooth Cartoon 8659: Astronauts in the lunar rover come across a 20 foot tooth on the moon says, "Houston, we have a problem. 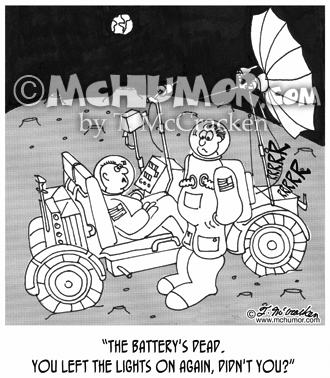 We're going to need a bigger toothbrush." 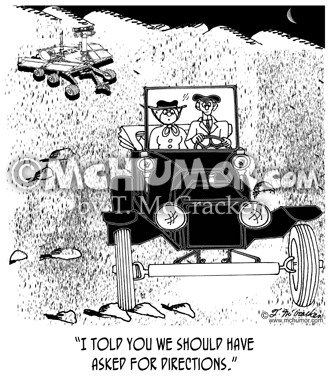 Marriage Cartoon 8239: A woman in a Model T car that's on Mars says to her husband, "I told you we should have asked for directions." 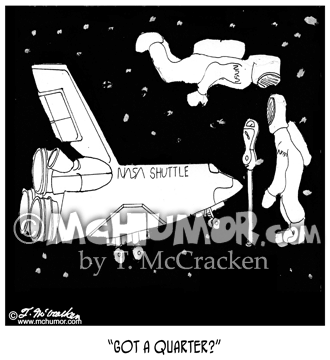 Space Cartoon 0371: At a parking meter in space a space shuttle astronaut asks another, "Got a quarter?" 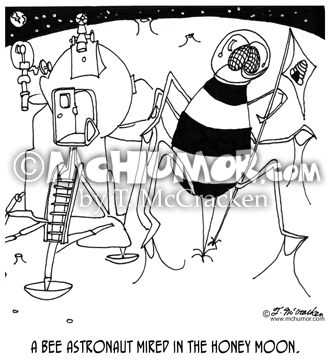 Bee Cartoon 6687: "Bee Astronaut Mired in the Honey Moon." 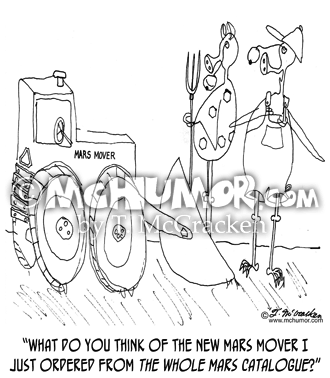 Bulldozer Cartoon 0278: A Martian farmer showing off his new bull dozer asks another, "What do you think of the new Mars Mover I just ordered from The Whole Mars Catalogue?" 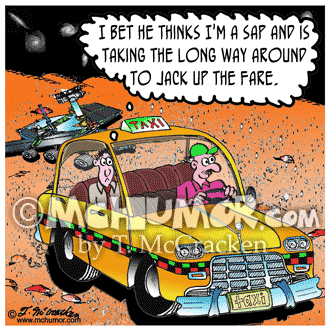 Taxi Cartoon 8637: A man in a taxi driving on Mars thinks, "I bet he thinks I'm a sap and is taking the long way around to jack up the fare."